Love it! Y'all were so cleaver to pick St. Patrick's day! The thought never crossed my mind! The bead bokeh is awesome! Well, I think you got a great photo even while waiting til the last minute. You shot it perfectly with great dof. I happen to love it. Great job team. it's a great pair, last minute or not:). it's always when you are looking for that perfect shot that panic sets in...not that that ever happens here ;). It is funny how the theme can seem so easy one week and so difficult on the last day, eh?? You know I thought the same thing. I would be able to find the perfect St. Patrick's Day picture, but I didn't find what I really wanted at all. Yeah for the beads! All my kids have spring break this week and that further hampered fun shots too. LOVE the green - suggests SPRING to me - haven't seen lovely green in a long while. Great photos - both the photos compliment each other so much! Nicely done. Don't be so hard on yourself, Jen!I really like the angle of your close-up shot, the shallow DOF and you managed to capture some lovely green bokeh in the process! What a fun theme! Would it be corny if I said you were really lucky that you found the St. Patty's day beads? ;-) Actually, I think it's a great shot. Who doesn't like an invitation for a kiss? Or jewel green bokeh?! I'd say you did a pretty darn great job on this dipy, last minute or no! looks perfect to me. and great thinking to do this theme this week! Yup, last minute or not, you blew it out of the park. 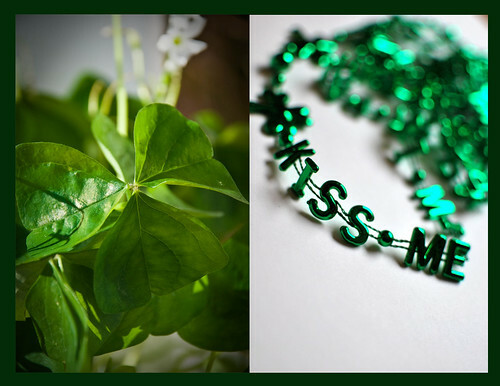 What's best about the beads to me is that you honed in on the "kiss me"! Great DOF too. Love them...both very green and Irish-y!